The Columbia Shuswap Regional District (CSRD) supported the development of a management plan for Gardom Lake for the benefit of area residents and visitors, now and in the future. The CSRD retained the Fraser Basin Council to coordinate and facilitate a collaborative planning process and to develop a plan. The planning process was completed in May 2015 and, following review by the CSRD, the final version of the plan is now posted: Gardom Lake Management Plan (Final). The plan includes a vision, goals, short and long-term objectives, and measurable actions for the management of Gardom Lake. It is advisory to the CSRD and other agencies that may have regulatory or other responsibilities for the lake. Thanks to all members of the public who provided feedback throughout the planning process, both at public meetings and through surveys. Your input has been valuable. Thanks to everyone who attended the public open house and meeting at the Ranchero – Deep Creek Fire Hall in May to discuss and offer comments on the DRAFT Gardom Lake Management Plan: Version 4.0, and thanks to everyone who submitted comments via the online survey. Your input is valuable. The work of the Gardom Lake Planning Committee is complete and a final version of the plan is now available: Gardom Lake Management Plan (Final). Notes on the public meeting and online survey are also now available: see Resources. 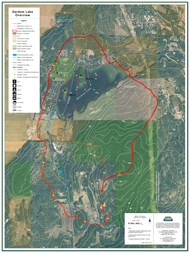 Here is a map of Gardom Lake (PDF), courtesy of the Columbia Shuswap Regional District. the introductory presentation at the November 24 public meeting. an overview presentation on riparian areas and their importance, made to the Planning Committee on February 11. For these and other background materials, see Gardom Lake Resources.